My mom ran a deli back in 1940's, right out of our house, these babies were loaded with Italian cheeses that bite you back sharp, Salami, Tomato, Lettuce, Italian dressing, Mortadella, Cappicola. She gave up the business when my two brothers became teenagers and eating all the profits, then of course I came along, later in her life and was a huge surprise at 39 for her to start all over again. I miss them every day that goes by and thank them for leaving me with their teachings, to pass this along to my kids and all of you. Happy Mothers Day to all my readers, wish you were here mom and grandmom! So, Italian Homemade Bread was a staple in our household. But long after that business closed, we still had our homemade bread, mom and grandma always made it from scratch, for Pizza Fritte and Pizza Pies, every week. 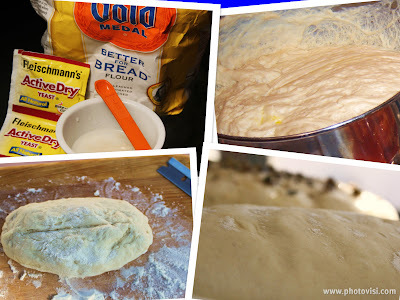 I like to use bread flour it's up to you as you can use regular, this makes a lighter dough and it doesn't seem to get dry the next day, if there's any left of course, (laughing). Bread is my weakness, I love bread, better than any cake or dessert, with butter you can't beat hot crusty bread and butter, in my book, and the smell baking is heavenly! The little torpedo loaves (oops another name), shown in the collage is cut in the center with a razor blade, you need a sharp cut, I always split the top , it allows for better baking and gives the bread a definite "home-made" look. The bigger loaf next to it will get cut before going into the oven as well. We love these to make sandwiches, use for garlic bread, or just spread with Flavored Butters out of the oven. A great tasting bread to dip in your favorite dipping mix and oil. I love the spices and olive oil and warm bread it's so addicting! I had made a double batch of dough, so this is a full size bread loaf. This dough below is ready to shape its already risen. Mix until forms a ball, knead until smooth and elastic, add more flour if dough is sticky , this should not be dry but firm until a ball forms. Rise in a bowl covered with a wet towel, until doubled in size in warm spot, away from draft.... On a large cookie sheet that has been coated with oil or sprayed with a lighter coating, take a handful of dough for each hoagie and shape into torpedo shapes, or round rolls or two small bread loaves, which ever shape you prefer. I also use this recipe for pizza dough. Very versatile dough, just a little different directions Let rise for another 1/2 hour. Bake on 430 degrees until light brown about 20 minutes. Remove from oven. Cool. You can keep these in plastic bags for a day or freeze them. Makes a dozen depending on the size or 2 small loaves of bread. How cool that your mom ran a deli! Lucky you. What a lovely post! Thankyou! Beautiful rolls! It is Mothers Day here tomorrow! Wonderful well-written post. Concise and informative. Cheers! LOL - grinders! I haven't heard that word since I was a kid. We used to have them with our friends from Mass. Thanks for the recipe. I can't find good sandwich rolls out here in California. these look great, can't wait to try them. Happy Mothers' Day to you! Those rolls look so golden and crusty! I wish I was your sister!!! You were so blessed to have talented mothers in your family!!! happy mother day,claudia!your bread is beutiful! What a sweet post! I am so sure your mom is looking down on you and beaming with pride. These rolls look amazing! Just like what you find in an Italian deli here in NY...but probably better! I am impressed and am definitely bookmarking these. Happy Mothers Day Claudia! Great post, beautiful loaves. I so feel the same about my mom and grandma. Mmm... homemade sandwich rolls sound fantastic! ooooh,....these look so cool & fab & so tasty too! Yummmmm,....another must make recipe of yours! Those breads look very tasty! I'm saving it down for later use. Thanks! You have a nice day, Claudia. I'm with you fresh baked bread with butter is my weakness. I used to go to my grandma's house after school when I was little and remember walking in some days to the smell of fresh baked bread. It was like heaven. I will definitely try this recipe.